I was surprised when a friend at High School said to me, “I envy you, as an artist you see beauty in everything”. Until then I had not realized that we don't all see the same thing and that my talent was not just a love of and ability to create but also a unique way of seeing and appreciating what I saw. In my paintings it is not just the view, scenery or objects that matter but how, as an artist I am able to perceive and interpret them. I capture my vision in my paintings from the subjects I feel a deep connection with. Each of my paintings present a new way of seeing a scene or subject, some which may be familiar and others not. Some of my work is of wilderness scenery and wildlife that I find only by getting off the beaten track and exploring nature in undeveloped places. Finding my subjects and preparing my compositions are as much a part of my creative process as applying brushstrokes. My paintings shine a spotlight on the beauty that I see and I am always pushing myself to hone and evolve my artistic skills to create art that is fresh, original and a genuine expression of my personal view and connection with what I see in nature. 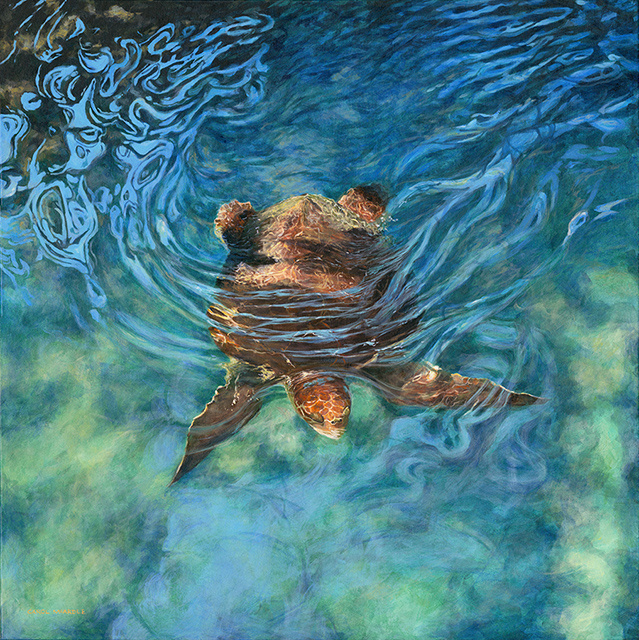 "Water Baby" Acrylic 36" x 36"